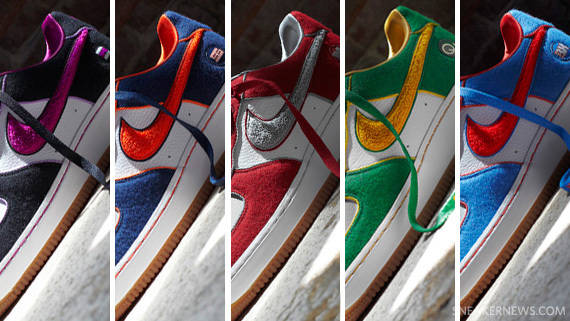 Dropping tomorrow is the Nike Air Force 1 Low Supreme 5 Boroughs Pack; with five great colorways to choose from, you have the option of being true to your borough by copping the pair represented by your hometown, or showing your overall NYC pride by getting your hands on all five. Designed by NYC-native DJ Clark Kent, the Air Force 1 Low Supreme 5 Boroughs Pack features a wool upper with 3M piping, a chenille swoosh, and a satin inner liner. The entire 5 Boroughs Pack will drop at 21 Mercer, House of Hoops, and will also be available on Nikestore for the out-of-towners. Individual borough colorways have already dropped at select sneaker shops in each borough, and Foot Locker on 34th St. will also drop the Manhattan colorway. Check out the detailed images after the jump and be sure to cop yours tomorrow.